JNN 26 June 2014 Baghdad : At least 130 Takfiri Terrorirsts have been killed in an airstrike carried out by the Iraqi military on their positions in the central city of Tikrit , and in other Operations in and around the Outskirts of the Baghdad . As the Sunni Tribes has also volunteered to Stand Shoulder to Shoulder to Iraqi armed forces to fight the Wahabi Terrorists. Iraqi state television says the Sunday airstrike targeted a group of militants in the city, which is the capital of Salahuddin Province, north of Baghdad. The Takfiri militants, led by the so-called Islamic State of Iraq and the Levant (ISIL), have overrun most of one province and parts of three others north of Baghdad. The terrorists also captured four cities as well as a border crossing with Syria during Friday and Saturday clashes in Anbar Province. Iraqi security forces announced that they have killed a senior ISIL commander in clashes near Tal Afar region. Iraqi security forces have inflicted heavy losses on the Islamic State of Iraq and the Levant (ISIL) terrorist group in another operations near the capital, Baghdad. More than 90 ISIL Takfiri militants were killed in the Iraqi army operations in Tikrit and Fallujah on Sunday. Army spokesman Qasim Ata says they have killed 42 ISIL militants and destroyed 13 vehicles in fighting in Tikrit. Reports say 50 al-Qaeda linked militants were also killed in Fallujah while trying to infiltrate into a military checkpoint. Security forces say they have killed a senior ISIL commander in clashes near the strategic town of Tal Afar. This is while the terrorists are said to have extended their grip on the town of Rutba. It is the fourth city falling to militants, after Qaim, Rawah and Anah. The developments come against the backdrop of a savage offensive by the ISIL terrorists in Iraq. A Sunni Muslim group called “Ahl al-Sunnah”, consisted of eight Sunni tribes in the Iraqi southern province of Basra, has registered to fight against radical militants from the so-called Islamic State of Iraq and Levant (ISIL). 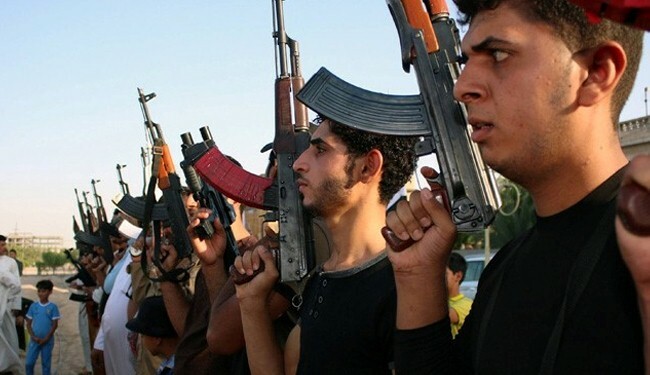 Al-Alam correspondent in Basra reported on Tuesday that fighters from eight Sunni tribes registered the “Ahl al-Sunnah” group to cooperate with the army in their fight against the ISIL militants. Sheikh Muhammad Blasem, head of the Waqf Office for Sunni Muslims in Basra, told Al-Alam reporter that the group is going to fight for protecting Iraqi people under the command of Iraqi security forces. Iraqi forces continue their battle against the ISIL Takfiri group, which is threatening to take its acts of violence to several Iraqi cities, including Baghdad. Hundreds of thousands of volunteer fighters have formed defense groups to help their army fight against Takfiri militants. Political commentators say Iraq has been targeted by US-trained Takfiri terrorists who will doubtlessly target the United States. Iraqi Prime Minister Nouri al-Maliki has repeatedly blamed Saudi Arabia and Qatar for the security crisis and growing terrorism in his country, and denounced the Al Saud regime as a major supporter of global terrorism. Iraqi Prime Minister Nouri al-Maliki has said that his country will contain terrorists and get over the ‘conspiracy’ that has already taken hundreds of lives. Earlier this week, Iraq’s Prime Minister Nouri al-Maliki lashed out at the US regional ally Saudi Arabia for supporting the ISIL terrorists, who are perpetrating genocide against the Iraqi nation. Riyadh’s support for the ISIL makes the Saudi regime responsible for the “crimes that may qualify as genocide the spilling of Iraqi blood, the destruction of Iraqi state institutions and historic and religious sites,” Maliki said in a statement. Days ago, Iraq’s top Shia cleric, Ayatollah Ali al-Sistani, called for the people to join the battle against the terrorists and defend the country. Iraqi media say more than two million people have so far voiced their readiness to join the fight. On Saturday, a military parade was held in Baghdad in solidarity with the Iraqi army, which is engaged in heavy fighting against the terrorist group, the ISIL. The parade was called by senior Iraqi cleric Muqtada al-Sadr. A UN report said on Tuesday that more than a thousand people have been killed in the recent unrest only between June 5 to 22. This entry was posted in Iraq News, Middle East and tagged Baghdad, Basra, Iraq, Iraqi security forces, iraqi Sunni Volunteers, Islamic State of Iraq, Sunni Tribesmen. Bookmark the permalink. IT IS NOT A SUNNI – SHIA CONFLICT, NOT THE LEAST AS BOTH THE WAHABI TAKFIRI AND THEIR US UK EUROPIAN ALLIES WISH TO PORTRAY , IT IS SIMPLY A FIGHT BETWEEN HAQ AND BATIL ,BETWEEN EIMAAN AND KUFR AND IN BETWEEN THE RIGHT & WRONG . IRAQ IS A SIRZAMEEN E HUSAIN (a s) . WAS HE ,THE SAVIOR OF ISLLAM , A GRANDSON OF ONLY SHIAS NABI (s) OR HE IS MUTABARRIK FOR SUNNIES AS WELL .INTERESTED PEOPLES , BOTH SO CALLED MUSLIMS AND NON MUSLIMS ARE TRYING HARD TO GIVE THIS CONFLICT A SECTARIAN COLOUR .WILL THEY SUCCEED? , NOT AT ALL ,TODAY’S MUSLIM IS NO MORE SHABILY INFORMED THOUGH THE OLD CONCEPTS DIE VERY HARD . 130 IS ALRIGHT BUT A VERY LOW COUNT, SOON TWO ZEROES OR THREE ZEROES OR EVEN FOUR ZEROES SHALL BE ADDED IN THE FIGURES WHEN THESE JEWISH INFIDELS, TAKFIRI WAHABIES WILL START FLEEING LIKE THEIR OLD MASTERS, THEIR HEROES DID IN THE PAST , IN KHYBER , IN KHANDAQ, IN BADR , IN HUNAIN AND IN SIFFEEN AND IN JAMAL . IT IS ALL THE SAME FOR THE LAST 1400 YEARS AND FUEL STUFF IS EDIQUATELY BEING PILED UP FOR THE JAHANNUM, THE MORE THE BETTER, IN THIS WAY , WE WILL BE ABLE TO SAVE ALLAH’S MASSIVE LEG (sic , but what can be done , hazrat abu horairah r .a .a. said that in a hadees ) .